One Big Girl in a Great Big Safe & Healthy World. I have failed at more things than can be listed in a blog or in a volume of encyclopedias for that matter. I started this one in hopes of putting “on computer screen” what a great big family means to this great big girl. It was created out of a deep passion for sharing what family means to someone who wasn’t able to make her own. Oh God, I thought – without kids, who is going to take care of us when we are old?!?! Well, surely if I create a blog about how important family is and when that time comes… someone – anyone?? – will step up and make sure I have sunlight, food, water, and a place (that isn’t my pants) to pee. I got two blog posts (great ones!) in. I stopped. I failed. A few years ago, I wanted to create a business called “D.I.Buy” with my sissy/bestie, Jennifer. I dreamt it up after many, many (many!) drinks in the backyard hanging with my homie hubby on a Saturday afternoon. Sure, everyone can “DIY”, but who wants to actually go to the craft or home improvement store and make all the stuff?? Not me. Wouldn’t it be SO cool, if instead of DIYing, you could just have all of the bits and pieces (wood, felt, screws, glue, glitter, light bulbs, unicorn dust, etc.) show up at your doorstep? All the elements arrive neatly packaged and delivered by the man in brown that make up that cool wine bottle/cheese tray/night light/shoe horn/iPhone case? Don’t want to put it together? That’s ok – me either – just pay a small fee and we’ll put it together for you and none of your friends will know your dirty little secret. Who wants DIY, when you can just D.I.Buy it? A sure fire success! Once, I had the idea that I wanted to create a top for to-go cups that was the top and the straw. Not a top. And a straw. But a top/straw. Less parts, less spillage. I have no idea how they would stack together in a box or on display, who cares, it’s genius. Now that straws are all but outlawed, I surely would have been wanted for top/straw treason. I stopped. Well, thank goodness I never got started. I failed. I’m good at making something out of nothing. Mostly, in the kitchen. I can take a can of chick peas, a parmesan rind, some chia seeds, a peanut butter patty, half a leftover green smoothie, and some frozen spinach and turn it into a killer dip or falafel-esque invention. Wouldn’t it be cool to start a YouTube channel called, The Escapades of Pantry Girl and her Vitamix? I’d have more followers than Katie Perry! This birdy would fly away with her Twitter crown. I do this (and film it in my head) and I fail regularly, but my husband eats it. Yay, win! I have failed at academia, corporate America, edgy start ups, direct sales, Nerium, Stella & Dot and so much more. All this noisy background brings me to now. This morning, I lay awake reading a book my friend and colleague required I read if I were to be any kind of self-respecting entrepreneur. A book brilliantly written by one of her marketing professors. It is called “KNOWN: The handbook for building and unleashing your personal brand in the digital age” by Mark Schaefer. This is not an endorsement, but I do recommend checking it out. It’s about how to be steadfast about making yourself known. Not famous or even infamous, but known. In the book, he shares great stories as inspiration. Stories about regular people that identify a niche (both blase and weird), stick to it, and become locally or internationally known YouTube stars, 1 million follower bloggers, and global keynote speakers. My favorite story may be Brazilian Isadora Becker – a chef who dresses up as characters as she makes dishes famous in films, books, and history. Girl – the only word I know in Portuguese is queijo. I don’t need to understand what you are saying to know that you give queijo muito gusto! Point after point, example after example, that even a DIBuy, big girl from a big family without one of her own, top/straw scofflaw, “failure” can become known if she puts her mind to it. But what could it be??? I started this blog eons ago. Averaging 1 blog post per Presidential Administration. I called it “onefromthemany” in honor of the Great Seal of the United States. E Pluribus Unum. 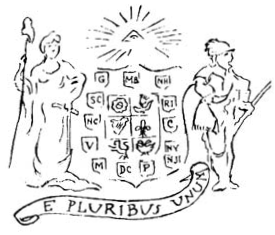 It symbolized at the time (defacto US motto before “In God We Trust” took over) – out of the original 13 US colonies, emerged one nation. Beautiful, right? It resonated with me back then and still very powerfully does today. Then for the first time since the Obama Administration (sigh! ), I had an email show up in my AOL (yes!) account that someone new was following my “blog”. Huh????? That thing is still around? How do I even access it? What’s my password? Is there a password?? And who the heck is this lady? She must be lost. Very lost. It was a sign from the Gods. Or the lost lady on the internet looking for a blog about Colonial America or Latin trivia. I bet you didn’t realize it lost internet lady, you were the click that launched a thousand ships! Technically, that is two things, but really there is no health without safety and surely no safety without health. Not my own, mind you – oh gracious, for those that know me, know I break, tear, injure, and destroy everything – but worker health and safety. I am absolutely abound with luck to co-run an organization called the International Safety Center. We focus on protecting those who care for others. Specifically, protecting those working in all sorts of healthcare settings from exposure to infectious disease, mainly bloodborne pathogens like HIV, hepatitis viruses, and the scary emerging bugs. These exposures happen mostly from needlesticks, injuries from contaminated surgical instruments, and disgusting splashes of blood or body fluids to the face when PPE is not being worn. Our tagline is “Safer Workers | Better Healthcare”. We envision a day where there are no occupational infections or illnesses. We work tirelessly to write, lecture, teach, present, and analyze data in hopes that by understanding how these exposure incidents occur, we can help healthcare institutions around the world better protect their workers. In a world so laser focused on patient safety – I always say – without healthcare workers, there simply is no healthcare. So, here’s what hit me like a ton of stainless steel surgical instruments – and a surgical robot to boot. One from the Many. Yes, from 13 colonies emerged one nation (no comment on barbaric and hubris tactics here), but from the single worker (you, me, your kid, your mom, your brother-in-law, even your dog), emerges the great many (all of us, together). The teacher, the nurse, the truck driver, the trash hauler, the farmer, the iPhone box packer, the fisherwoman, the sales rep, the Grandmom raising her kid’s kids, the executive assistant, the prison guard, the painter, the engineer, the financial analyst, the crane operator, the stay at home Dad, the house cleaner, the barista, the YOU – they are the ONES, that make us the Mighty Many. Without them doing their jobs, you simply can’t do yours. Starting today, this blog is dedicated to them. It is dedicated to you, the work that you do, your ability to do it as safely as possible, and the responsibility your employer and your workplace has to keep you safe, so you can return home to your family, friends, and fur babies, healthy and well. onefromthemany.com is now a blog dedicated to advancing the health and safety of working global citizens. I will not fail you. It won’t be pretty. It may not be pithy. But it sure will be honest and real. It will promise to fill a much needed gap and it sure as heck will come from the heart. Without those who work – no matter the job or the size (or lack) of a paycheck – whether we are 13 colonies, 50 states, or 195 countries – we are simply a lot of ones missing the opportunity to be the mighty many. Labor Day Weekend | Work It! Books, Tomato Pie, and Aunt Cathy – Oh My! Hello Great Big World! A new blog built with love.